Sun-Soaked Private View Terrace in the Historical Centre of Cortona. Our Most Popular Apartment! 2018 Certificate Of Excellence Winner and 9.8!!! Our New Super Panoramic View Terrace is waiting for you! 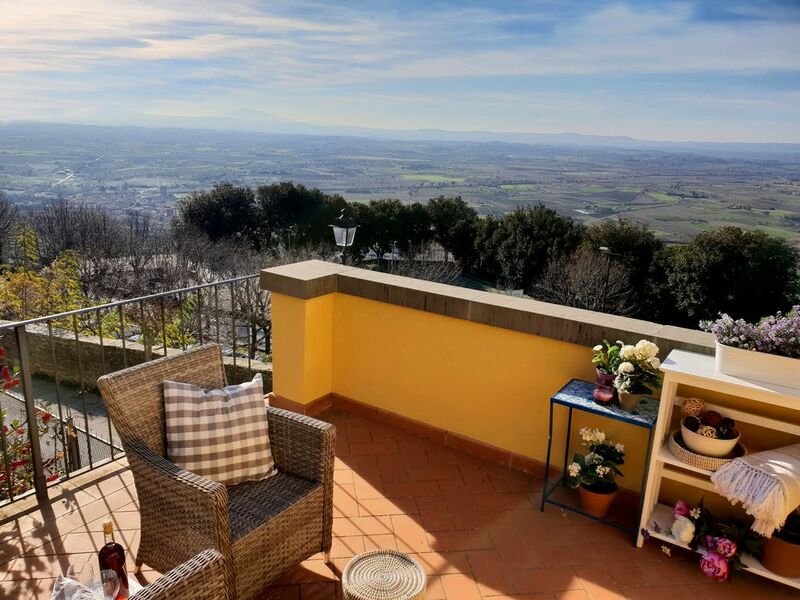 There are only a handful of apartments in Cortona that have a view as spectacular as La Terrazza di Cortona. Imagine waking up to the romantic sound of church bells and the sweet smell of Tuscan flowers just outside your door. Overlooking the entire valley below, you can see from Lake Trasimeno, across to Mt Amiata, further to Montepulciano and beyond. Relax on your private 3 x 6 meter ( 6 x 12 foot approx) terrace and dream of life in Italy. Sip your favorite wine and watch the sunset over the hills. Our new 2 bedroom/1 bathroom private apartment is a rare gem that sits quietly within the walls of the Historical Centre of Cortona. Within just a few minutes, you are in walking distance to everything. Cortona is a beautiful town, made famous by the book/movie Under the Tuscan Sun and it is everything you dreamed of and more. Spend your days wandering the ancient streets, eating delicious homemade pasta in one of the many restaurants and sipping Aperol Spritz while people watching in Piazza Signorelli. Cortona is PURE MAGIC, and returning home to La Terrazza di Cortona to watch the sunset is what memories are made of. There is a 60€ Final cleaning fee and tourist tax of €1.50 / person per night (max 4 nights) due in cash on arrival. Baby crib/playpen and high chair (not guaranteed availability) please ask when booking. WE HAVE A NEW APARTMENT IN THE AMALFI COAST! STAY IN TUSCANY AND AMALFI!! ASK ABOUT OUR SPECIAL PRICE FOR GUESTS THAT STAY IN CASA DI AMICI IN CORTONA, TUSCANY AND LE TERRAZZE IN AMALFI. VISITOR TAX due in cash of 1,50 euro per adult (over 12) / per night (max 4 nights) is mandatory for all of Cortona. This will be collected on arrival. Our standards are very high and these apartments are truly magnificent! We are a Canadian/British family that fell in love with Italy over a decade ago. After spending one too many winters in Canada, we decided to make the move to Italy full time, and we have never been happier, healthier and content. Italy is special, and Tuscany is unlike anywhere we have ever experienced. Just ask anyone who has had the fortune of visiting. Even if only for a few days, weeks or even extended stay, there is something alluring about this magical place. We fell madly, crazy and passionately in love with Cortona, its beauty, food, wine, community and people. We have learned to live life slowly, enjoy friendships, and savour the mouth-watering food! Retirement is fantastic, but we are still young and like to keep busy. As my dad once said, “The worst part of retirement is that you never have holidays!” How true! So, to keep us occupied, and mostly to meet more wonderful people from all over the world, we bought three apartments in the historical centre of Cortona to rent as tourist rentals. From these apartments (Casa di Amici) we have branched out and offer help to many local Italians that also have beautiful apartments for visitors to enjoy. So between long lunches, wine tastings and exploring all corners of Italy, we are here to help welcome many visitors to Cortona. There are many places to stay in Tuscany and the Cortona area. However, we highly recommend you choose a location within the Historical centre. Although the surrounding Villas although very beautiful, are also quite remote and can be more inconvenient. We love to open the door and be steps to cafes, restaurants, shops and of course nightly passeggiata! HUGE private View terrace 2 bedrooms Amazing View In the Historical Centre Full Separate Kitchen If you choose to stay at Casa di Amici great! Or, if you just want to ask some questions about Italy, Tuscany or the region, do not hesitate to contact me. I love to talk about Italy and to help you have a trip of a lifetime! We have central heating. There is a sur-charge in the winter months. Please ask at time of booking. Soft, fluffy Italian linens on all beds. No parking in front of the house. However there is a lot of free parking around Cortona and only a short walk into the Historical Centre. 2 sets of fluffy soft towels and hand towels for each guest is supplied. Full beautiful designer kitchen stocked with all the essentials too cook your favorite foods and try some local recipes! Full sized refrigerator, stovetop, oven, sink, fan. There is a table for up to 4 in the kitchen. Childs highchair may not be available. Please enquire at time of booking. Local channels only - however with WIFI you can easily connect to your own Netflix or similar streaming account. 'When in Rome, do as the Romans do' Italy is very relaxed and I have never met anyone that didn’t fall in love with the people, scenery, food and lifestyle. It truly is everything you have ever heard. The Italian people are generous, friendly and warm. Slow down. Take the time to really see Italy. Walk slower. Eat slower. Don’t expect the same luxuries as in North America. Don’t expect to be served immediately or have lunch in 15 minutes or less. Savor the day, the time with friends and the experience. Enjoy the views and make your memories. I see foreigners racing through towns trying to pack everything in in a short period of time. Resist. Italy will draw you in and make you question your life back home. My husband and I thoroughly enjoyed our stay in the Sofia Terrace. Samantha and her husband Terry couldn't have been more efficient and helpful. The flat is so quaint (about a 600 year old building!) and the breathtaking view from the terrace is stunning. Sitting out there basking in the sun with a glass of wine is the epitome of sheer relaxation. The flat itself is very charming and quite roomy. The kitchen was great for breakfasts and snacks. The city of Cortona is walled so you can't bring your car in. No worries there are convenient parking lots (free) nearby. Yes, you walk up stairs and a hill to get to the flat, but that is the charm.of this hilltop town. Pace yourself and you will do fine. Comfy shoes are a must. Many restaurants inntown and Samantha recommended one that we really enjoyed. She has lots of other useful info for you too. All in all, we couldn't have been happier and definitely recommend this home to anyone who wants to enjoy historic Cortona AND feel like a local! Samantha’s place is lovely, especially the outside patio with amazing views. The location is perfect - easy walk to the town center. Be prepared to walk many hills - we loved the exercise ! The apartment was immaculate and the kitchen is well stocked. Cortona itself was delightful. We will definitely return. Samantha is also so helpful and easy to communicate with. My only problem with this property was having to pay the cleaning fee in cash and not knowing about it until we had already booked, also being charged for using the heat was unusual, we have rented many apartments in Italy in the past . It was a pleasure to meet you and welcome you to Cortona. I am so happy that you enjoyed your stay and loved the apartment and Cortona. It is a magical place! We only receive 5 star ratings so I was sad to see you marked us down a star for paying a cleaning fee and heat. The cleaning fee and heat is CLEARLY mentioned in the listing as well as in the welcome package and email that we send ahead of time. I am sorry that you did not read them. We work very hard to give our guests a 5 STAR experience and stay in Cortona and I hope that future guests will be able to see that the stay was perfect - and the 4 stars has nothing to do with the apartment or stay. I hope you had a great rest of trip in Italy and will return soon! Wonderful stay!! Just too short! A treasure in Cortona! The apartment was wonderful with everything you needed! Great location with beautiful views. The host, Samantha, emailed a wonderful brochure before arrival which all the info you needed for Cortona. Wonderful stay!! Samantha was the best host and very responsive! The town of Cortona was beautiful!! The Flat is super cute and very clean and right in the middle of everything! We had a blast! Would highly recommend!! Cortona is an ancient Etruscan town in the heart of Tuscany. It is famous for its history, archaeological finds and beauty. And for fans of Under the Tuscan Sun, this is the town where author Frances Mayes lives and the book/movie was made. Although most are disappointed when they learn the fountain was just a Hollywood prop, you can take a stroll up the hill and see her stunning house Bramasole. It truly is everything you imagine and more! But Cortona is more than the book, it has significant historical significance. Older than Rome, it has a very well appointed Museum and many churches and historical sites that should not be missed. Because Cortona sits on a hill, the views from every angle are spectacular. You can wander the old streets and never get tired of the beautiful sunsets and hidden vistas. Cortona is well equipped with 2 small grocery stores, pizzerias, bakeries, butchers, wine shops, many restaurants, bars, shops and art galleries. We have many festivals throughout the year revolving around art, food, wine, chocolate and special holidays and celebrations. The summer is packed full of things to see and do, with open-air concerts, Sagra's and many more things to do. It is a safe, warm, friendly place with the most welcoming local community that loves to see visitors fall in love with their city. I still have to pinch myself to make sure that living here isn’t just a dream. NOTE: Cleaning fee of 60 euro Cleaning per stay and payable in cash on arrival. Heating for winter charged at a 1,50 per metric cube used. Tourist tax for CORTONA is 2 euro per person / per night for a maximum of 4 nights (8 euro) This is collected in cash on arrival.